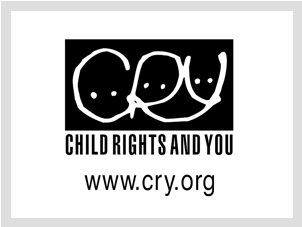 CRY is an Indian NGO that sees itself as an enabler, supporting grass-root initiatives on child rights issues such as Right to Education, health, malnutrition and protection. Each initiative combines direct action with children, community mobilisation and policy influencing components to maximise impact and ensure long-term viability. CRY’s development strategy is centred on community mobilization as the most effective long-term solution to the multiple causes of poverty, deprivation, exploitation and abuse that shackle India’s children. CRY’s mission is to enable people to take responsibility for the situation of the deprived Indian child and so motivate them to seek resolution through individual and collective action thereby enabling children to realise their full potential, and people to discover their potential for action and change. CRY works with over 150 project partners across 23 states to ensure lasting change in the lives of children. CRY interfaces with local government and other power structures and foster alliances with state, regional, issue interest groups. Through supporting networks, CRY provides a platform for partners to meet, share and learn from each other’s experiences. This enables the strengthening of field level initiatives.